Racine, WI: Whitman Publishing Company, 1940. Paperback. Wide 48mo. Stiff glossy pictorial wrappers. 64pp. Numerous color illustrations. Very good. Faint edgewear only. A tight and nice copy of this World War Two-era guide to identifying (to cite front wrapper) "60 Airplanes Illustrated in Full Color." Each full-page image bears explanatory text beneath. This publisher does not cite edition in a consistent, verifiable manner. New York: Cupples and Leon Company, 1936. Hardcover. 8vo. Orange cloth with blue lettering and device, pictorial dust jacket. 208pp, (4pp), 208pp, (4pp), 208pp, (4pp), 212pp. Frontispiece. Very good/very good. Top of rear board slightly warped and spine a tad wavy; text block moderately and evenly age toned as usual and endpapers a bit spotty; jacket faintly edgeworn and a bit age toned, with single tiny chip at spine head; non-authorial gift inscription on front flyleaf. A tight, attractive first edition of this omnibus volume gathering the first four of the 6-volume "Slim Tyler Air Stories" volumes, first published individually in 1930-31. Bright and catchy front jacket artwork. Waltham, MA: Dr. Perna, 1970. Hardcover. 8vo. Pale blue cloth with black lettering, pictorial dust jacket. xv, 383pp. Near fine/very good. Bit of jacket edgewear. Handsome and tight first edition of this fictionalized tale of WW2 glider gladiators by a podiatrist who actually was one, signed large and bold by him in blue ballpoint on front flyleaf. By ZEMKE, Hob, and FREEMAN, Roger A. New York: Crown Publishers, 1989. Hardcover. 8vo. Blue cloth spine with gilt lettering and cream paper over boards, pictorial dust jacket. x, 243pp. Illustrations. Near fine/near fine. Superb, tight reprint edition of the 1988 Orion Books edition of the renowned WW2 ace's memoir. Chapel Hill: Algonquin Books, 1989. Hardcover. 8vo. Grey and black paper over boards with black spine lettering, pictorial dust jacket. xiii, 267pp. Illustrations, map endpapers. Near fine/near fine. Just a book club edition, but tight and bright and pristine. New York: Orion Books, 1990. Hardcover. 8vo. Red and mustard paper over boards with silver spine lettering, pictorial dust jacket. xii, 240pp. Map, illustrations. Fine/fine. Merely a book club edition, but wonderfully tight and perfectly pristine. New York: Orion Books, 1988. Hardcover. 8vo. Red and black paper over boards with gilt spine lettering, pictorial dust jacket. xii, 243pp. Illustrations. Fine/fine. Only a book club edition, but superbly tight and pristine. New York: Orion Books, 1989. Hardcover. 8vo. Blue paper over boards with silver spine lettering, pictorial dust jacket. xviii, 270pp. Illustrations. Fine/near fine. Only a book club edition, but quite handsome and tight. New York: Orion Books, 1991. Hardcover. 8vo. White and blue paper over boards with red spine lettering, pictorial dust jacket. xix, 348pp. Illustrations. Near fine/near fine. Only a book club edition, but tight and handsome. New York: G.P. Putnam's Sons, 1896. Hardcover. Small 4to. Burgundy cloth with gilt lettering and device. xxvii, 459pp, (4pp ads). Top edge gilt. Very good. Mild edgewear, else tight, nice and internally fine. First edition of the first volume (only) of this notable pair -- with lovely autograph addition: Tipped to the front flyleaf is an irregular 5 3/4" X 1" slip bearing the typed salutation "I am, with cordial regards, / yours faithfully" followed by Putnam's bold signature in black ink. Tipped above this is the 8" X 2½" printed letterhead portion ("G.P. Putnam's Sons / Publishers and Booksellers") of Putnam's stationery. Putnam (1844-1930) was the son of publishing house founder George Palmer Putnam (G.P. Putnam's Sons) and himself a Civil War veteran, author and businessman, and became head of that firm after his father's death; in addition to this book, he authored "Some Memories of the Civil War" (1924), "Memories of My Youth" (1914) and "Memories of a Publisher" (1915). First volume only, but nice and bearing interesting author signature. New York: The Platt & Munk Co, 1940. Hardcover. Illustrations by Irvin L. Holcombe. Wide 8vo. Burgundy cloth with large color plate to front board, pictorial dust jacket. Numerous full-page color plates, with text entirely in blue. Near fine/very good. Mild jacket edgewear; front flyleaf ownership signature. Tight and quite nice first edition of this charmer, with delightful large color plates illustrating noteworthy planes ranging from the Wright Brothers earliest effort and the Ryan Monoplane (Spirit of St. Louis) to the Grumman Fighter and Boeing Stratoliner. Uncommon. By DAVIS, Benjamin O., Jr.
Washington, D.C.: Smithsonian Institution Press, 1991. Hardcover. Small 4to. Brown cloth spine with silver lettering and tan paper over boards, pictorial dust jacket. x, 442pp. Illustrations. Near fine/near fine. 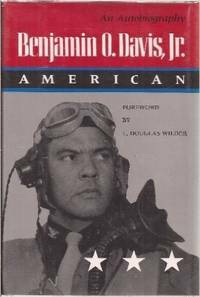 A tight, attractive second printing of this memoir of the first black general in the U.S. Air Force. Akron: The Saalfield Publishing Company, 1930. Hardcover. 8vo. Brown paper over boards with black lettering and decoration, pictorial dust jacket. 252pp. Frontispiece. Very good/very good. Jacket edgeworn, with edge chips -- but complete and overall bright and attractive; text block moderately age toned as usual. 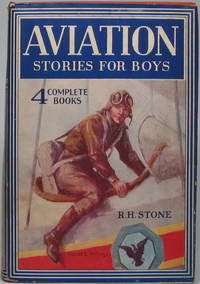 A tight and nice copy of this young adult tale of Hal Dane and his passion for flying versus his interest in aeronautical invention -- a volume in Saalfield's "Aviator Series." This publisher does NOT indicate edition in a consistent, verifiable manner. Garden City: Garden City Books, 1952. Hardcover. Illustrations by Clifford Geary. Edited by Helen Hoke. 8vo. Orange cloth with blue and white lettering and pictorial stamping. 192pp. Numerous line drawings, graphs, diagrams, blue pictorial endpapers. Fine/very good. Mild jacket edgewear. A wonderfully tight and handsome first edition of #R33 in the nonfiction "Real Book" series. On the half-title page, the author boldly signs and inscribes in black fineline: "For.... / with thanks from / Hal Goodwin." Harold L. "Hal" Goodwin (1914-90), who also wrote popular titles under the pseudonyms Blake Savage and John Blaine, penned a number of boy's adventure novels -- yet books signed by him are surprisingly uncommon. N.p. : Naval Institute Press, 1991. Hardcover. 8vo. Blue cloth with silver spine lettering, pictorial dust jacket. 182pp. Illustrations. Fine/fine. Tight, nice second printing. Manhattan, KS: Sunflower University Press, 1997. Paperback. 8vo. Stiff glossy pictorial wrappers. xxii, 197pp. Numerous illustrations. Fine. 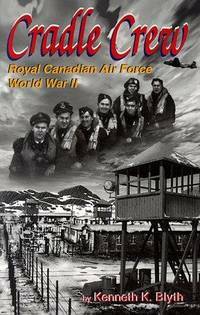 Pristine and tight first edition of this RCAF pilot (1924-2009) who led a bombing crew and ended up a German POW. Handsomely inscribed and signed by him on the half-title page: "5/28/07 / To Jack / A little piece of WWII history / Best Wishes / Kenneth K. Blyth." New York: E.P. Dutton & Company, 1947. Hardcover. 8vo. Brown paper over boards with black lettering and pictorial stamping. 139pp. Frontispiece, map, illustrations, pictorial endpapers. Very good. Small ownership signature on front pastedown. A tight and attractive later (16th) printing of this slim bestselling narrative whose subtitle says it all, boldly signed by Whittaker in full in blue ink on the title page, opposite his head-and-shoulders frontispiece portrait, where he adds "Best wishes of." Rickenbacker was undertaking a special flight for the U.S. Government when he and crew went down in the Pacific in November 1942; they were rescued on a raft after 23 days, and he wrote of his experience in his 1943 book "Seven Came Through." Springfield, MA: McLoughlin Bros. Inc, 1930. Hardcover. Introduction by Captain Eddie Rickenbacker. Small 4to. Red cloth with black lettering. 316pp. Frontispiece, illustrations, pictorial endpapers. Near fine. 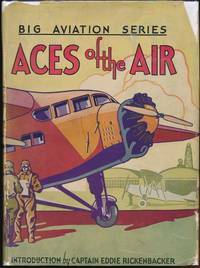 A tight, quite attractive first edition of this large volume in the young adult "Big Aviation Series," a broad survey featuring chapters on every conceivable facet of aviation likely to interest youngsters, such as Lieut. A. Soucek's "My Flight to 39,140 Feet," Lieut. H.B. Miller's "Parachutes!," T.J.C. Martyn's "Women Find Place Among the Fliers," Captain F.I. Eglin's "Life of a Flying Cadet" and Henry Ford's "Never Has Been Airplane Engine," among many others. Ownership signature on front flyleaf of then 10-year-old future educator and University of Dubuque president Walter F. Peterson (1920-2007). 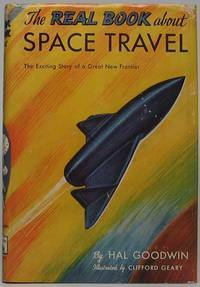 By FEIST, Uwe, and FRANCILLON, Rene J.
Fallbrook, CA: Aero Publishers, 1967. Paperback. Small 4to. Stiff orange pictorial wrappers. (Ca. 150pp). Extensive illustrations. Very good. Spine a tad rough, but overall tight, clean and nice. First edition of the first volume of this largely pictorial trilogy. New York: The Viking Press, 1978. Hardcover. Small 4to. Red cloth spine and grey paper over boards, pictorial dust jacket. xiv, 336pp. Illustrations, maps. Near fine/very good. Mild jacket edgewear. 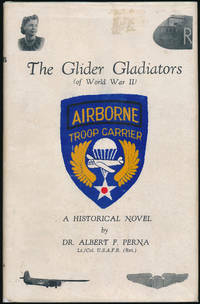 A tight and nice fourth printing of this account by this U.S. Army lieutenant general (1907-90), third commander of the 82nd Airborne Division during World War Two.